An engineering firm had placed transformers at a substation located adjacent to a coastal wastewater treatment facility in Texas. In 2015, the substation began reporting issues with premature corrosion on radiators and fans. 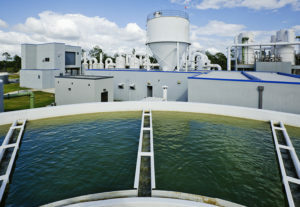 Samples were taken of the corrosion and the engineering firm reached out to the wastewater treatment lab to understand the chemical processes used at the facility. Engineers learned that a chlorination process was used as well as diluted hydrochloric acid to assist in the breakdown of waste. Plus, pure oxygen was used to speed the process, leading to hydrogen sulfide gases. The combination of elements/chemicals, together with the C5 marine atmosphere featuring almost constant prevailing winds forced the customer to replace radiators. Fortunately, the replacement radiators were given a Heresite coating as a primer.